How can you eat healthy without spending a lot of time or money? This is a vexing question because most of us are limited in either money or time (and most likely - both). Most of us grab the food off the shelf that says "All Natural" and we keep moving. Unfortunately, this can lead you to some really bad food. But, there is some great packaged food. I take the time to look for fabulous snacks whenever I go to the grocery store. This time, I found these fruit and nut snack packs in the produce section. 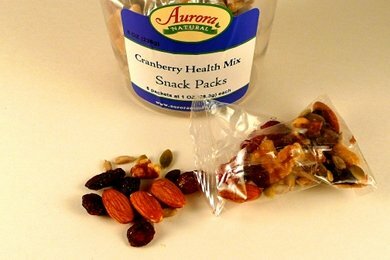 Aurora Natural has created a "Cranberry Health Mix - Snack Pack" (they should probably rename it). But for $4, you get 8 snack packs that have 100 calories each. So, a mere 50 cents each (take that Snickers)! What is in them? You can choose different mixes, but mine had peanuts, Raisins, Almonds, Sunflower Seeds, walnuts, and dried cranberries. Just toss them in your purse or briefcase and you are done! They are nutritious and satisfying. So, don't buy those snack packs with fake Oreos, find something like this. I found these in my local "Stop 'n Shop" on the East Coast - but I bet another version of these exists in many grocery stores around the country. Just be sure to look in the produce section near the dried fruit and nuts. Of course, if you have time, you can make your own "health mix"- coming soon! What is your favorite packaged snack? Please share in the comment section below. The taste of candy - and nutritious! I love the rice cakes by Quaker! The apple cinnamon ones have 50 cal and no cal from fat! They are easy, affordable and my kids love them! My favorite packaged snack are Lara bars and KIND bars. A bit more than 100 calories, so I usually use them as part of my breakfast, but they're a great high-fiber, nutritious, gluten-free snack to have in your purse in case of emergency!